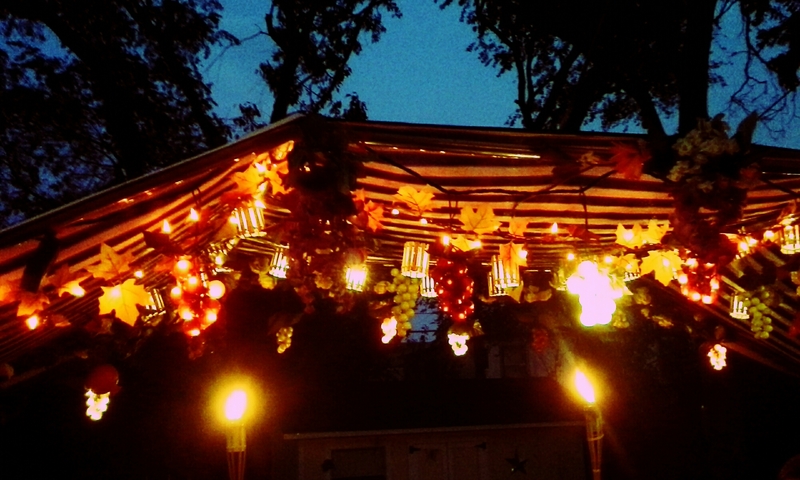 As there are several Jewish holidays the feast of booths, also known as Sukkot, is probably my favorite one. Don’t misunderstand me, eating fried foods during Chanukah is fun, eating Matzo ball soup is yummy, marching around with the Torah at Synagogue is a mermable holiday, too. I don’t know what it is, but there’s just something special about Sukkot. The story behind Sukkot is the Israelites wandered the desert for 40 years. Therefore, Jews and Gentles are to sleep and eat outside in “Sukkots” and reflect on G-d’s provirsion for the Israelites. A Sukkot is a “hut” like structure Jewish families live in during this holiday. The Sukkah is decorated by the family often times with fruits and vegetables that are associated with fall harvest. It is by no means that I am someone who adores nature. For example, I have limited knowledge of insects and think that about every insect is poisonous. For being someone who isn’t necessarily a fan of “the great outdoors,” it can be a struggle to embrace this holiday. Yet, somehow it’s one of my favorite holidays. There’s something special about having synagogue outside. About the congregation decorating a Sukkot and just having a more of a relaxed service after Yom Kippur which is a very serious observance. This celebration lasts for one week. As I mentioned earlier, the feast of harvest, otherwise known as the feast of booths, is about remembering to stay faithful. A few days ago, one of my Jewish friends told me that his family did not check the weather before going to sleep in their sukkah and the family was awakened in the middle of the night by a rain storm. Needless to say, they didn’t sleep in there Sukkah all night. This is literally a perfect example about having faith through the storms. When my friend went to bed, they didn’t assume the weather would get bad, but instead had faith that everything would be fine. So many times it’s easy to have faith in G-d in the sunny days but difficult to adhere the same faith when the storms pour. Even the Israelites had a chance to get out of the wilderness after wondering for only ten years but because they had a lack of faith they wondered for an entire forty years. Please be encouraged to every day, be bold in your faith and trust in G-d always. Even in the darkest times you don’t know when there may be a small ray of light coming your way. The next time you consider losing your faith, remember G-d will persevere and think about the Israelites and the real reason for Sukkot. Previous Post Confidence is Silent but Insecurities Scream.